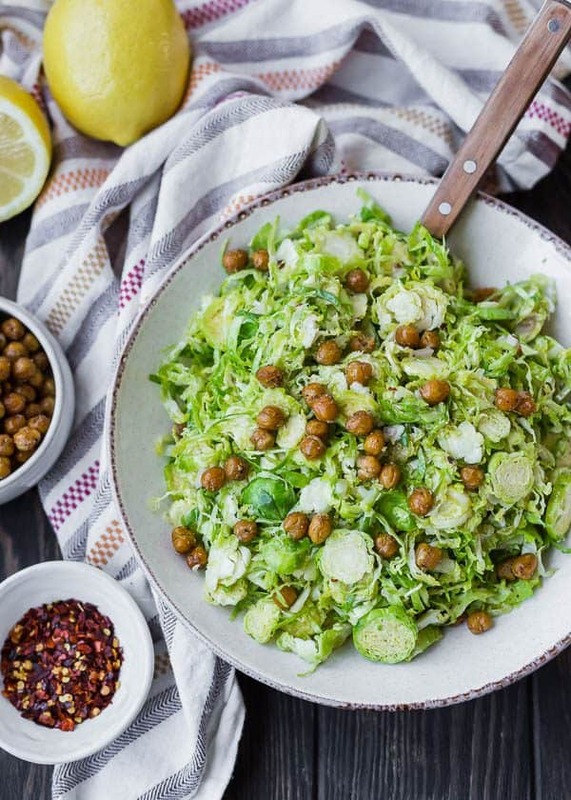 This Brussels Sprouts Salad Recipe with Crispy Chickpeas is simple perfection. It’s a fresh and flavorful side dish that’s easy to prepare and goes great with fish or chicken. 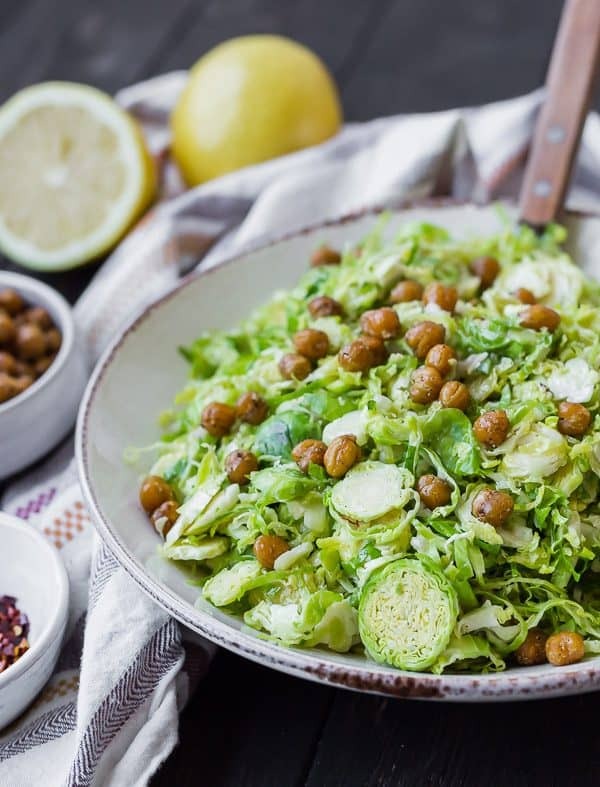 As promised Monday, this is the Brussels sprouts salad with the ill-fated crispy chickpeas from Monday. 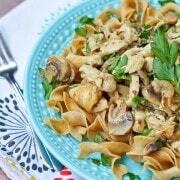 It’s one of those recipes that is simple and elegant without being fussy or containing 50 different ingredients. 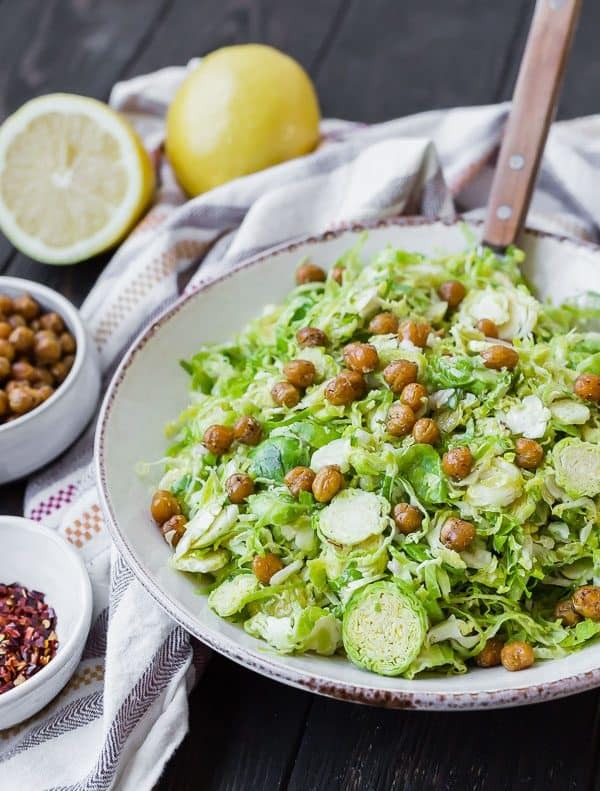 The Brussels sprouts hold up well to the dressing, making it great for easy meal prepping and planning ahead. I’m still trying to get my life organized after Christmas (umm…our decorations may or may not still be up…can someone please come take them down for me?). Healthy eating is hit-or-miss as usual, but I’m all about balance and moderation, so we’ll just pretend it’s on purpose. Salads like this make it a little easier, though. 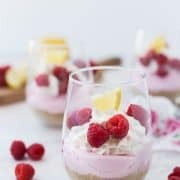 It’s easy to make and it keeps well in the fridge for at least a few days, so it’s great to have on hand. It’s also easy to dress up with other ingredients I have in the fridge (chicken, avocado, cheese, etc), so it is helpful when I’m trying to be a little more “hit” and a little less “miss” when it comes to staying on track with nutritious, healthy meals. 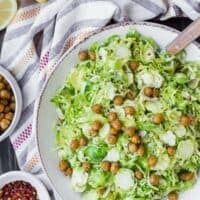 As a bonus, if you need it to be for any reason, this Brussels sprouts salad recipe is dairy-free, gluten-free, vegan, AND nut-free. And you could make it Whole30 compliant and paleo, too, if you want. Tip: If you’re unsure how to slice the Brussels sprouts, this is a helpful guide. You can also do it in your food processor with the slicer blade. Dairy-Free: Follow the recipe as written. Gluten-Free: Follow the recipe as written. 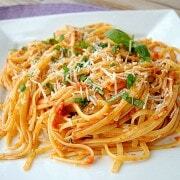 It would also be great with some shredded or chunked Parmesan cheese, or toasted pine nuts. Nut-Free: As written! 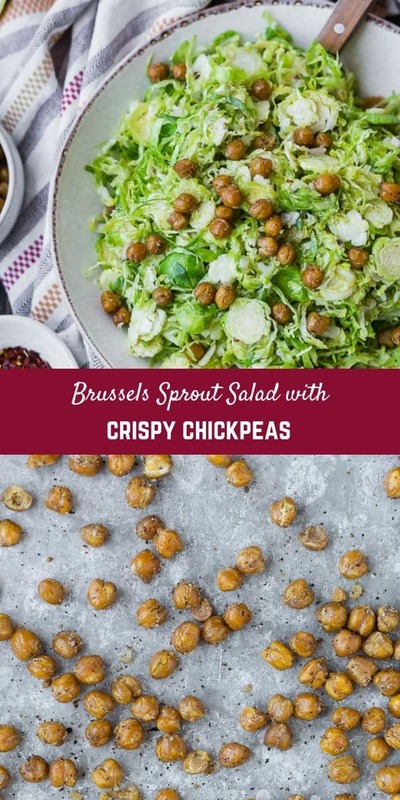 You’ll love those crispy chickpeas to give you that great crunch that you get with nuts. Whole30: Skip the chickpeas, use toasted pine nuts. Make sure to choose a compliant Dijon mustard for the dressing. Paleo: Again, skip the chickpeas, use toasted pine nuts. Make it a hearty meal: Add turkey, chicken, or add more chickpeas. This salad would also be fantastic with diced avocado for a touch of decadent creaminess. I don’t have a whole lot more to say about this one, guys. It’s a great salad…and you should try it! 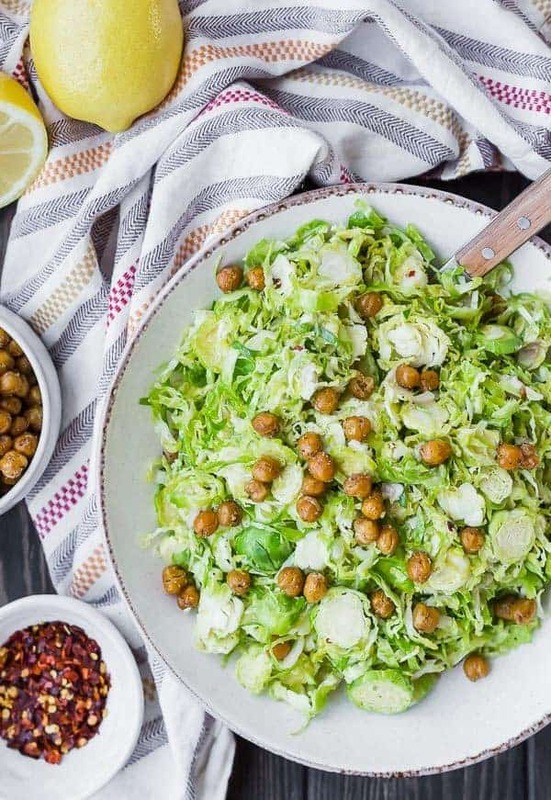 This Brussels Sprouts Salad Recipe with Crispy Chickpeas is simple perfection. It's a fresh and flavorful side dish that's easy to prepare and goes great with fish or chicken. Trim stems off Brussels sprouts, remove any bad leaves, and slice very thin. You can use a shredded or slicer attachment on a food processor for this step if you want to make it go really quickly. I used a sharp knife. 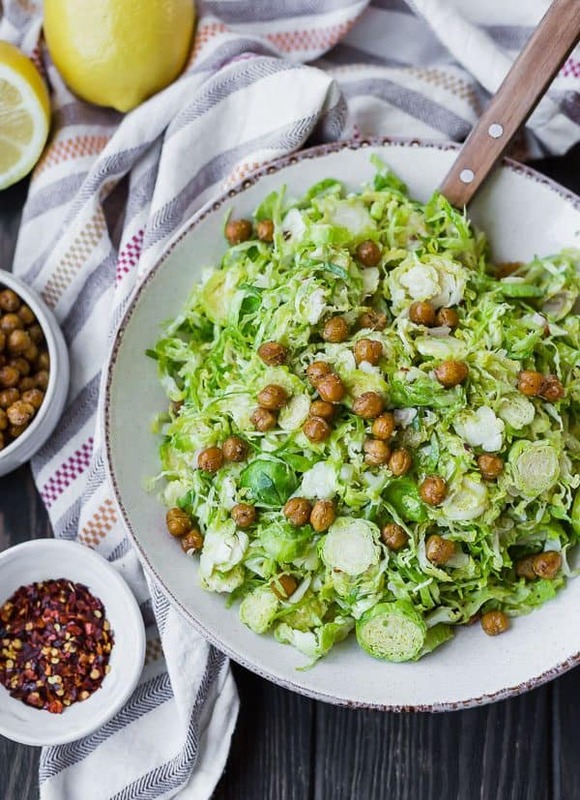 Place Brussels sprouts in a large bowl. In a small bowl or measuring cup, whisk together olive oil, lemon juice, shallot, Dijon mustard, salt, and red pepper flakes until combined. Pour dressing over salad and toss to combine so that dressing coats all ingredients. Sprinkle crispy chickpeas on immediately prior to serving. If you'd like to change up the toppings, try toasted pine nuts or freshly grated Parmesan cheese. This salad will keep for 3-4 days covered in the fridge. Verdict: Love this one! Give me any salad with lemon and dijon and I’m pretty much sold on it. Husband’s take: I’m not even sure Ben tried this one! Sorry, Ben. Changes I would make: None are necessary, but there are suggestions in the recipe card if you want to make it your own!